A discussion during the SoW-DCS test mission came up last night, regarding the use of electronic means to detect positions for attacking targets. The point was in regards to flying at night or in bad weather and a comment was made that this sets modern warfare apart from WW2. In fact, the "Blitz" of 1940 was an electronic warfare battle, with a variety of measures and counter-measures being employed by both sides. The Luftwaffe was conducting many of its bombing raids at night, and then the problem was knowing where the target was. To solve this, a system of radio beams were used. To start, a radio beam would be transmitted in the direction of the target. A bomber flight would fly out until it intercepted the beam. They would then turn to follow the beam to the target. A second radio beam would be transmitted from a different location, but also pointing at the target. As the bombers flew out along their primary beam, there would be a point where they crossed the second beam. At that point they would be over the target and would drop bombs. Rather than precision bombing individual sites, they would drop long sequences of bombs, relying on area saturation and incendaries to do the damage. Another method was to employ specialised units to make use of the beams, and then drop flares to mark targets for the main bomber force. This technique was used many times, the most notorious raid being that against Coventry in November 1940. The British managed to figure out what was going on, and started trying to jam or confuse the signals. The Germans responded, thus leading to an escalation of ever-increasingly-sophisticated systems (Knickebein, X-Gerät, Y-Gerät) to outwit the other side. It was as much the boffins, as the RAF, that thwarted the effectiveness of the Blitz. No game or simulator has ever implemented such a system. The closest was the non-directional beacon (NDB) in CloD. The XVII used these for a few raids, with the only one success (against Manston). 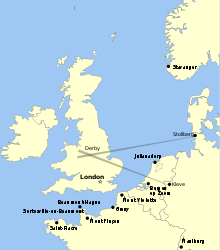 In fact, the NDB locations on the LW side during the SoW campaigns were the actual Knickebein and X-Gerät sites for precisely that reason. The problem was that the NDBs had extremely limited range and there were hardly any targets where there would be decent triangulation. That and the CloD weather/nighttime implementation was bug-ridden. DCS certainly has the right sort of simulator engine to implement this type of thing, but it doesn't have any WW2 bombers (let alone 1940 Luftwaffe ones). Then the RAF follow on with 'Gee' and 'Oboe' later on. Gee was very similar to the German system from 1940 and equally got jammed. less sure about Oboe. I had great luck to find a booklet written by Alexander Dahl (Bumerang, Lehmanns Verlag, München, 1973) where one can find a lot of details, too. During some phases in 1944 /45 the Germans at least were able measure the Oboe-beams and warn the areas, high valued targets mostly. Trying to find my way into the Viggen I checked quite a few sources (mostly DCS-forum-threads) about the way radar, radio and ECM is done in DCS. Hm, it is done in very simple ways mostly, I was astonished. And all depends on ED to enhance the infrastructure, implement "new" features. Sadly I can't see ED shows much interest in historically correct procedures and a believable background infrastructure. To put it more mildly - maybe the business pressure is too high to put manpower into details where a profit is difficult to measure. Anyhow - this kind of detail is what I need to feel a long-time immersion.